The Blogger Formerly Known As Drea M. | The Ramblings and Rants of Drea M.
The Blogger Formerly Known As Drea M.
But these names paled in comparison to what she wants to name a future, as-yet-unborn child. Anyway, I’ve been having a field day, telling everyone I’m going to change my name to Zamboni in honour of Sarah Palin. Today, I discovered that a fellow blogger has put up 10 bucks – that’s right, 10 whole bucks (albeit Canadian bucks…I kind of would have hoped for a dare from one of our American neighbor bloggers, but still…) for me to actually do it. And well…I will do absolutely ANYTHING for a cheap laugh. Let this be a lesson to you all. 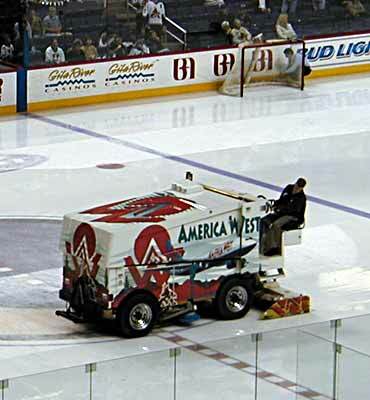 I will throw $20 American if you have a baby by September 30th, 2009 and name it Zamboni. That gives you a month to plan this out. I will also double it if you have twins and let me name the other one. By the way, I always thought it was Zamrbroni so I learned something today. You crazy Canadians. I hate you, Straight Cash Homey. HATE YOU. You haven’t heard the last of this. I think you spelled Heart incorrectly. It looks like you spelled it as H-A-T-E which says Hate. Might just be the language barrier. Also, please do not read my hockey post. I may not be a fan of your sport but I do like health care and Alex Trabec. As a good will gesture, I will raise my offer to 25 Canadian but the date will have to remain the same.